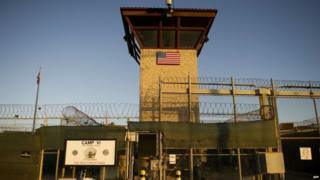 The White House says President Barack Obama is considering "a wide array" of options for closing the controversial US military prison at Guantanamo Bay. Spokesman Josh Earnest said winning Congress approval to close the jail would be the best option. But he did not rule out executive action as a means to shut it down. President Obama is determined to shut down the prison before the end of his term in 2017, but faces bipartisan opposition in Congress. The US has slowly been sending prisoners back to their home countries or to third countries. Just 116 inmates currently remain compared to the prison's peak population of 684 in 2003. But closing the prison would likely require the transfer of some Guantanamo inmates to jails within the US, a measure that has already been banned by Congress. Some have been considered too dangerous to be released, but the US holds no evidence that can be used in civilian or military trials against them. The White House says it will be sending a plan to Congress soon, the details of which have yet to be revealed. Spokesman Josh Earnest said on Monday the best way to close the site would be to win congressional approval. "But the fact is the best way for us to do this is for members of Congress of both parties to work effectively with the administration," he told reporters. Closing the prison was one of the first directives President Barack Obama ordered two months after he was elected in 2008. The camp was established in 2002 by the Bush administration to detain the most dangerous suspects for interrogation and the prosecution of war crimes. Controversy has centred on the period of time detainees have been held without charge and the use of interrogation techniques.